We all have been on the consumer side of credit card transactions, but until becoming a store owner most people are not aware of the processes that go on behind the scenes that get the money from the consumer to the merchant. In this post, I’ll try to explain the inner workings of the process for charging credit cards and some of the steps you should take as a store owner to make sure you get paid and keep your books in order. Authorization: The merchant swipes the credit card, enters it in their online gateway or their shopping cart automatically requests the gateway to seek authorization for charging a stated amount to the credit card account. Ultimately the issuing bank either approves or denies the transaction based on the standing of the account number. For transactions where the credit card is not physically presented to the merchant, generally verification information including the expiration date, name of the account holder, their billing address on file and CVV code on the back of the card are entered. If this data is provided, the authorization also includes AVS and CVV response codes to indicate whether the information matches the information on file with the issuing bank. This can be used by the merchant to assess the fraud risk associated with the transaction. If the transaction is accepted by the issuing bank, it also puts a reservation on the funds so that the merchant is guaranteed to be paid if they execute the transaction. However, at this point no funds actually change hands. Sale: The merchant executes the transaction, which puts things in motion to transfer the payment from the consumer to the merchant, however, at this point money does still not change hands. All the sales and credits made are simply added to a queue of transactions to process. Batch Submission: At the end of the day or at another specified interval all the pending transactions are combined into a batch and submitted from the gateway to the payment processor. The payment processor (MasterCard, Visa, etc…) then retrieves the funds from the issuing banks and deposits them into the merchant’s merchant account. Since you as the merchant do not get paid until the transaction is submitted as part of a batch to the payment processor, it is good to reconcile your batch reports to make sure that each transaction that you think has been made gets included in a batch. More importantly that demarking batched transactions are SuperManager’s abilities to tell you what transactions are not yet batched. There are two methods it uses to do this. 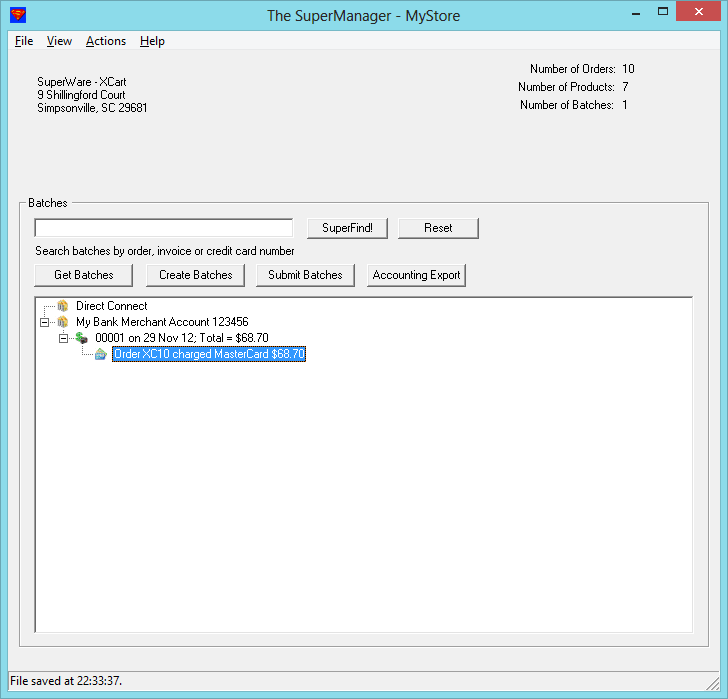 First of all you can have SuperManager filter its list of orders to only show you orders containing one or more unbatched transactions. 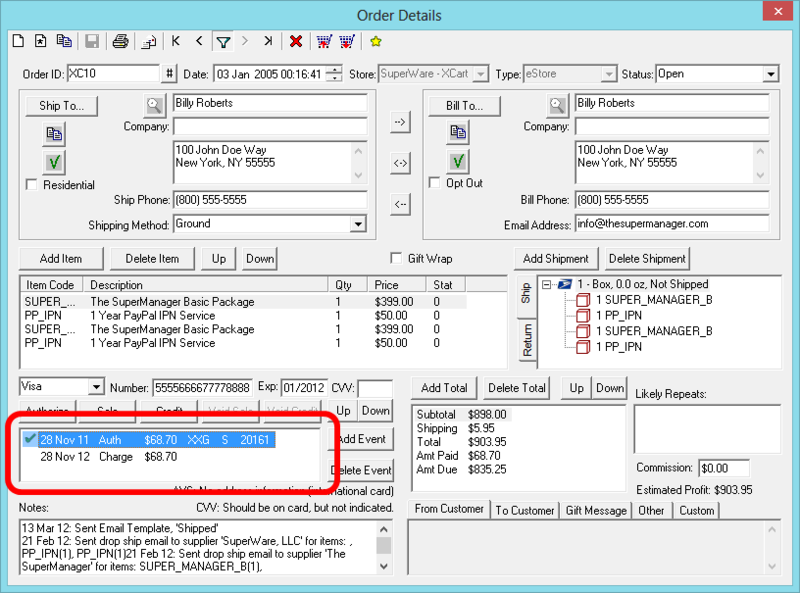 To do this, you go to “View”, “Orders” to show the order list and switch to the “SuperFilter” tab of the order list. Then from the filter choose the “Unbatched Payments” filter and press “Go”. The other way, and perhaps a better way to show you the list of unbatched payments is to choose “Actions”, “Payment Events”, “Unbatched Events Report”. This will show a list of all transactions and their amounts so that you can see all the unbatched transactions, their value and the total unbatched value.